The series was reported by Bob Hohler, Beth Healy, Sacha Pfeiffer, Andrew Ryan and editor Patricia Wen. Today's story was written by Hohler. NFL teams said no 112 times to selecting Aaron Hernandez in the 2010 draft. The word was out: Hernandez, the nation’s best collegiate tight end, was a problem. Scouts described him as a social misfit with a serious marijuana habit, and there were concerns about his possible ties to criminals in his hometown of Bristol, Conn. Yet with the 113th pick of the draft, the New England Patriots took a chance on Hernandez. Leaders of the most successful football team of the 21st century saw themselves as uniquely suited to molding troubled players into valued contributors. They were banking on their system to keep Hernandez in line. For Hernandez and the team, the pick would prove a massive miscalculation. Hernandez would play at Gillette Stadium, an easy two-hour drive to his hometown, where, as a teenager dealing with upheaval in his family, he had increasingly hung out with a bunch of small-time criminals. Hernandez would eventually hire two Bristol buddies with criminal records as assistants, one of them a drug dealer who supplied him with pot. “I think this story turns out a lot differently if he’s, say, in Seattle or San Francisco or someplace just out of reach of Bristol, Conn.,” said Greg Bedard, who, as a football columnist for the Globe and Sports Illustrated, covered Hernandez from his rookie training camp until his final day of freedom. But it wasn’t just geography. It was also the franchise. By the time Hernandez arrived, owner Robert Kraft, coach Bill Belichick, and quarterback Tom Brady had built a dynasty that had won three Super Bowl championships. Their win-at-all-costs approach left little room for the personal problems of players in distress. Even when Hernandez finally approached Belichick in a state of deepening paranoia in 2013 — afraid for his family’s safety — his coach saw little reason to get more than minimally involved. For three bizarre years, teammates and team officials watched Hernandez spiral into trouble with a range of reactions from bemusement to annoyance to alarm; some also learned to give his Bristol crowd a wide berth. Hernandez could be weirdly warm and fuzzy one minute, wildly raging the next, and, as time went on, frequently agitated — and armed. There’s no evidence that his coaches or others associated with his football career knew with certainty that Hernandez was heavily into drugs or dangerously brandishing weapons, but there were plenty of warning signs. As long as he performed weekend miracles on the football field, no one seemed too eager to find out more about what was up with Hernandez, chalking up his behavior to his youth and dubious choice of friends and hoping that a fiancee and a new baby would turn him around. That, it turned out, was wishful thinking. Police first visited Aaron Hernandez’s home within a year of his first Patriots training camp. At 3:45 a.m. on April 30, 2011, Plainville police received numerous calls about a fight in progress in the street in front of Hernandez’s rented townhouse. He was arguing with Brandon Beam, a former Bristol Central High School football teammate. Beam and Hernandez had been out drinking in Boston, according to a previously undisclosed transcript of an interview Boston homicide detectives later conducted with Beam. Beam told the detectives he was driving Hernandez home from Boston in Hernandez’s Range Rover when a state trooper stopped him for speeding at 120 miles an hour in a 55-mile-an-hour work zone and for weaving between lanes. Beam said he was fortunate, despite receiving a $998 ticket, that Hernandez was riding shotgun. It was a Friday night, and if the trooper had arrested him for reckless driving — a distinct possibility given the circumstances — he would have spent the weekend in jail awaiting a court appearance. Beam and Hernandez were free to go, but the episode wasn’t over. Hernandez was so angry about the traffic stop that the two feuded loudly in the street until the Plainville police, also recognizing the NFL star, shooed them indoors. Beam was a choirboy compared to some of Hernandez’s other Bristol friends, such as Alexander Bradley, a drug dealer Hernandez met while he was in college. Bradley became Hernandez’s chief marijuana supplier, no small role considering Hernandez’s prodigious use of the drug. A mug shot of Alexander Bradley, an ex-convict who was once close to Hernandez. Once Hernandez started collecting an NFL salary in 2010, he made Bradley a paid assistant. In addition to supplying drugs, Bradley’s job was to calm Hernandez, who often erupted into fits of anger and paranoia. Bradley later testified that one of his other assignments was to procure for Hernandez a $375 silver revolver. Wherever Hernandez went, a gun often went, too. One night in the summer of 2012, he turned up at a popular club in New York’s East Village and bought a drink for a female hip-hop promoter who hung out with him a few times. The promoter, who requested anonymity for fear of retribution, said Hernandez was different from other celebrity athletes she’d met: less entitled, more respectful. But she said she worried about the influence his ex-con friends from Bristol exerted over him. She described him as a follower. She vividly recalled riding along Manhattan’s FDR Drive with Hernandez and two of his Bristol friends. She was in the front passenger seat. Hernandez sat in the back with one of his friends, who had a gun. The rear windows were open. But she was furious, she said. And concerned when she saw Hernandez smoking marijuana and snorting cocaine that night. The incident ended their relationship. She thought Hernandez needed help. Such help, however, was unlikely to come from his mother. Hernandez and his mother, Terri, remained estranged after she dated his cousin’s ex-husband, Jeffrey Cummings. And things with her weren’t so stable: A few weeks after Hernandez signed on with the Patriots, his mother called police in Bristol, Conn., saying Cummings had been drinking and slashed her cheek with a knife during an attack. Some who worried about Hernandez, including Florida teammate Tim Tebow and Tom Brady, did try to steer him from bad influences. In 2011, Brady was caught on videotape speaking to Tebow, by then the quarterback of the Denver Broncos, after a Patriots game in Denver. Tebow had tried to mentor Hernandez in college and later asked Brady for help. It proved no easy task. “I’m trying to watch over Aaron and Brandon,’’ Brady told Tebow, referring to another former Florida player, Patriots linebacker Brandon Spikes. “I appreciate that, man. They’re good guys,’’ Tebow responded. Hernandez leaned on that support, at times. He would later say in a phone call from jail that he had once asked Brady, receiver Julian Edelman, and the team’s offensive coordinator Josh McDaniels how they would respond if he landed behind bars. Would they stand by him, or forget him? McDaniels, however, did try to dispense some life advice to Hernandez, according to texts between Hernandez and others in the Patriots organization that the Globe obtained. Brady’s personal trainer, Alex Guerrero, also took a turn trying to counsel Hernandez, texts indicate. The Patriots under head coach Bill Belichick and owner Robert Kraft had astronomically high standards — no coach had ever won the Super Bowl three times in four years — and they measured employees by results. They had lots to love about Hernandez, who started out, at 20, as the youngest player in the league and quickly became one of the multibillion-dollar enterprise’s prized assets. Hernandez was the latest in a stream of players with bad reputations the Patriots had taken on. Belichick and his staff failed to rehabilitate some, such as Willie Andrews, who arrived in 2006 with a criminal record that included a gun conviction. Andrews departed in 2008 after he was arrested twice in five months, first on charges he was distributing marijuana, then because he allegedly pointed a gun at his girlfriend’s head during an argument. The first case was continued without a finding, and Andrews was acquitted in the second case when his girlfriend declined to testify. Belichick’s way did, however, work with other players. They included Randy Moss, who had past run-ins with the law and a history of the NFL fining him for misconduct, but he blossomed into Brady’s favorite receiver when he came to New England in 2007. On the field, it all seemed easy for Hernandez. He and Rob Gronkowski emerged as the most potent tight end tandem in the league, combining for 169 receptions, 24 touchdowns, and 2,237 receiving yards in 2011 alone, all NFL records for a pair of tight ends. They became an NFL sensation, known among fans in some parts as the Boston TE Party. Others favored “Shake and Quake,’’ for Hernandez’s speed and agility, and Gronkowski’s devastating force. In some ways, Hernandez was even more valuable to the Patriots than Gronkowski, who was a better blocker and an impossible matchup down the field, but he didn’t have Hernandez’s athletic versatility. In addition to his receiving skills and gift for gaining ground after his catches, Hernandez was flexible enough to double as a running back, a valuable extra dimension. As the Patriots marched toward the Super Bowl in Hernandez’s standout 2011 season, the new star gave his team and its fans a late-season scare. In a divisional round playoff game against the Broncos, he was trying to score the first rushing touchdown of his NFL career. He needed to gain four yards, but he barreled ahead only two yards before he collided with Denver linebacker Joe Mays and suffered a concussion. Hernandez appeared groggy walking off the field and received medical attention on the sideline. He did not return to the game. The Patriots knew plenty by then about the dangers of football head injuries — and the purported damage to their own players. In 2007, the Globe had told the story of former Patriot Ted Johnson, who was suffering from severe depression that he believed was connected to Belichick rushing him back after he absorbed back-to-back concussions within days during the 2002 season. By the time of Hernandez’s concussion — the second documented brain injury in his football life — five former NFL players had committed suicide and been diagnosed with CTE. Within five months of Hernandez’s concussion, two more former NFL players would kill themselves, including a 43-year-old former Patriot, Junior Seau. Both deceased players also were diagnosed with CTE. In Hernandez’s case, the Patriots classified his concussion as minor. He didn’t miss practice the following week, though he was listed as “limited.’’ And he indicated to reporters during the week that he was OK.
“I just do what the coaches ask,’’ he said. He did what NFL gladiators do: He played on. It’s impossible to say what, if any, effect the concussion had on Hernandez’s behavior, but it joined a growing list of things that could have harmed his brain. In addition to smoking large quantities of marijuana and sometimes using other drugs, Hernandez now had suffered at least two concussions and had absorbed countless hits to his head since he began playing tackle at the age of 8. Early in the second half, Hernandez caught a 12-yard touchdown pass from Brady to give the Patriots their largest lead over the New York Giants, 17-9. But the merrymaking was short-lived. With 64 seconds to play, the Patriots fell behind, 21-17. As the clock ticked, Brady attempted seven passes. He targeted Hernandez with four of them, connecting on only one, and his final incompletion — on a Hail Mary attempt to Hernandez in the end zone — sealed the defeat. The sting for Hernandez was eased by the promise of better days to come. He led the Patriots in receptions (8) and receiving yards (67). 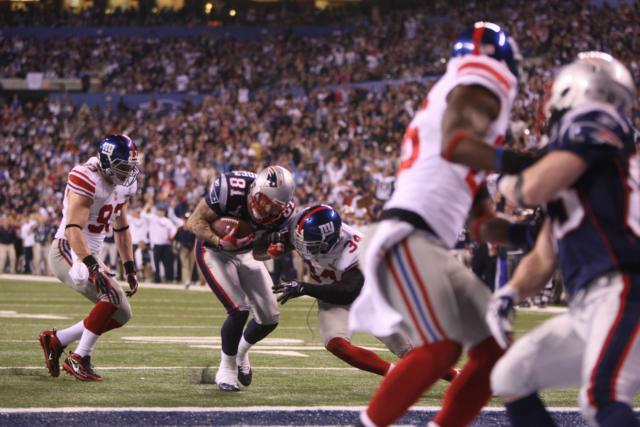 Hernandez was now a key cog in the Patriots machine. The famously stoic Belichick showed how he felt about his tight end at training camp the next August with an unexpected display of affection. Then-Globe football writer Shalise Manza Young inquired whether Hernandez had asked Belichick to make his “boo-boo” better. He felt much more love a few weeks later in August 2012 when the Patriots awarded him a seven-year contract extension worth $41 million, with a guaranteed $12.5 million signing bonus — the largest bonus ever for a tight end. The Patriots made a very young and troubled man very rich. He was all of 22, and he showed his appreciation by donating $50,000 to a charity named for Patriots owner Robert Kraft’s late wife, Myra. He also said what Patriots executives wanted to hear. If Belichick and Kraft knew anything about Hernandez’s disturbing behavior before his name became synonymous with shocking violence, they have yet to acknowledge it. But Hernandez’s issues were common knowledge in the locker room. Dane Fletcher arrived at Gillette Stadium in 2010 in the same rookie class as Hernandez. He became a rarity: one of Hernandez’s very few friends on the team. Initially, they hated each other. Fletcher, an undrafted free agent linebacker out of Montana State, needed to prove himself every day against Hernandez, who also had plenty to prove. Discuss: Does Hernandez’s life say anything about the game of US football, or do you see it as an isolated tale of tragedy and murder? They exchanged punches and insults, until one day Hernandez confronted Fletcher in the locker room. Fletcher, speaking for the first time publicly about their relationship, recalled Hernandez laughing at him “like the Joker in Batman’’ and reminding Fletcher how much he didn’t like him. Fletcher said he was not alone among Patriots who saw Hernandez consorting with his ex-convict cronies from Bristol. Belichick himself later told the State Police that he believed he saw Hernandez with an ex-convict from Bristol named Ernest “Bo’’ Wallace. Cocky and crass, Hernandez also quickly developed a reputation as one of the most talented and hardest-working Patriots, among the first to arrive for practice and the last to leave. Former teammate Rob Ninkovich referred to Hernandez’s “gifted hands” and spectacular athleticism, though has wondered if his sudden wealth, especially so young, sped his downfall. But Hernandez’s combustible temper became readily evident. In his first days in training camp, he threatened to “f— up’’ six-year veteran Wes Welker, after Welker teased him about needing help in the film room, according to individuals familiar with the incident. Receiver Brandon Lloyd, offering his most detailed account of Hernandez’s troubling behavior, said Welker warned him. But there was no avoiding Hernandez. Teammates described him as an attention-seeker who at times seemed unhinged. Hernandez’s erratic behavior enraged Brady, the legendary team leader, one day when Hernandez was sitting out practice because of an injury. On the sidelines of the non-contact practice, called a “walkthrough,’’ Hernandez kept referring to Belichick as “daddy,’’ as he had all season. Fletcher hired a limo one night in the summer of 2012 and shuttled Hernandez and one of his Bristol friends to a bar in Boston. When Fletcher left the bar, he discovered Hernandez and his Bristol friend seated in the limo with two strangers. He said the men introduced themselves as detectives. Fletcher assumed they were Boston police, but he said he never knew for sure. The detectives made no arrests and issued no warnings, according to Fletcher. The Globe has yet to determine who they were. That fall, Fletcher hoped the birth of Hernandez’s daughter, Avielle — on Nov. 6, 2012, Hernandez’s 23rd birthday — would change him. “Now he’s actually working for something and playing for something, not just himself, because I knew he was selfish,’’ Fletcher said. The baby’s mother, Shayanna Jenkins, had known Hernandez since elementary school. They had dated in high school, a period in which Hernandez also had secret liaisons with teenage boys, too. And they had stayed in touch during Hernandez’s years in Florida. When he reached out to Jenkins after college, she reached back. She moved into his townhouse in Plainville during his second season with the Patriots in 2011 and commuted for several months to her job as a manager at a Big Lots in Bristol. Then she discovered Hernandez had cheated on her and moved out. She started to grasp the burden of some NFL spouses — that NFL stars often get what they want. Over time, Jenkins chose to do what spouses of many famous figures have done — endure the infidelity. By the summer of 2012, she was back in Plainville and pregnant. By moving back with Hernandez, with their daughter on the way, Jenkins gave him a chance to show he could be a good provider. They got engaged and he bought them a $1.3 million home in North Attleborough. She had a nice Audi SUV, and bank records the Globe obtained indicate she was rarely short on spending money after he signed his big contract. But Jenkins learned painfully that Hernandez hadn’t become a family man at all. There were many nights when she saw little of her fiance as he caroused with his Bristol crew. One night, on July 15, 2012, Hernandez set out with Bradley to the Cure Lounge in Boston’s Theatre District. Many lives would never be the same. Read part four of Gladiator, “A killer in the huddle,” and sign up below to receive an email when the next story in this series is published.